A few of the images you see here I think might be good spark for an anecdote or two. So, with that in mind, I will take a few minutes to comment on how I came to create the images you see. 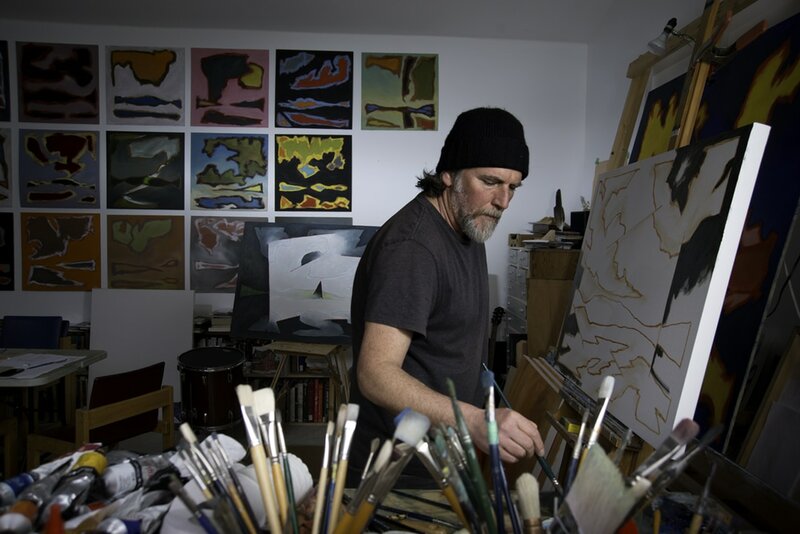 John paints in a fairly large open space, built specifically for his painting work. It also doubles as a rehearsal space when required and stores at least one set of drums. When I arrived to make a photograph, I took a look for an interesting angle and was sort of stumped. Long rectangular boxes are generally not that inspiring for me. The angle I initially wanted to shoot from would have put me directly behind him. Not good. I also didn't want to show the large window in the image. Doubly not good. The thought occurred to me that if I was to capture John in good light, doing his work at the canvas AND show an interesting background, I would literally need to be outside the building looking in. As a side note, I have noticed that in general the people who have taken part in my project have shown a great willingness to accommodate my penitence for rearranging articles that don't quite fit my artistic vision. In this case the article was me. I had to ask. So I did. "John does this window open?" "Yes." "Do you have a ladder?" "Yes." Out I went, camera in hand. I set up his ladder and found my position at the window. the pop-up flash on the Nikon camera. About 10 minutes later I had everything set up and we began shooting portraits. popular local painter hard at work. Lesson learned: Always remember to bring your eye glasses, and your Hoodman Loupe to view the LCD outside. Also, don't hesitate to ask what needs to be asked. Next up.... illustrator and painter, Patrick Fitzgerald. When you look at his portrait, what do you notice? Do you see the large painting to camera left, leaning against the wall? Do you see the intensity in his face as he adjusts the paint on a canvas? Do you see the dead guy standing behind him? Patrick is an illustrator and painter. A prolific painter in fact. His house (mostly the second floor) is littered with wonderful paintings here and there. In the halls, in the bathroom, in his office, in the bedrooms. It's rather impressive actually. This is one of the reasons why I shot him the way I did. Usually when I approach a scene, I take a few minutes to go over the visual landscape in an attempt to mentally edit out what I don't want in the image. In this case, I didn't want the 20 or so paintings of various sizes in the scene as they would have simply looked like clutter. In typical fashion, my subject took my request seriously and removed all the pieces I wanted out of the space, and leaned that lovely piece against the wall. His easel was already in a prime location, so no need to move that. After I had set up my light to illuminate him, I had to deal with the reflection in the clock case. No problem. Just rotate the entire clock to the right. Done. Patrick had this terrific display skeleton on a movable base. I concluded that including it would add a bit of humour to the portrait and asked him to wheel it over. Perfect. Just what the shot needed. Now it may not seem that I pay much attention to wardrobe when it comes to my personal grooming. But when I am photographing a living, breathing person, I pay very close attention. Patrick did too. He made suggestion after suggestion as to what he should where, how he should sit, the brush he should be using etc, etc. I had to laugh, it was so funny. In about 40 minutes we were able to pull together a pretty good image that speaks to the quality of his work, and the joyful attitude he exudes. Thank you Patrick. Next up, Bronson Smith, painter, puppeteer and collector. 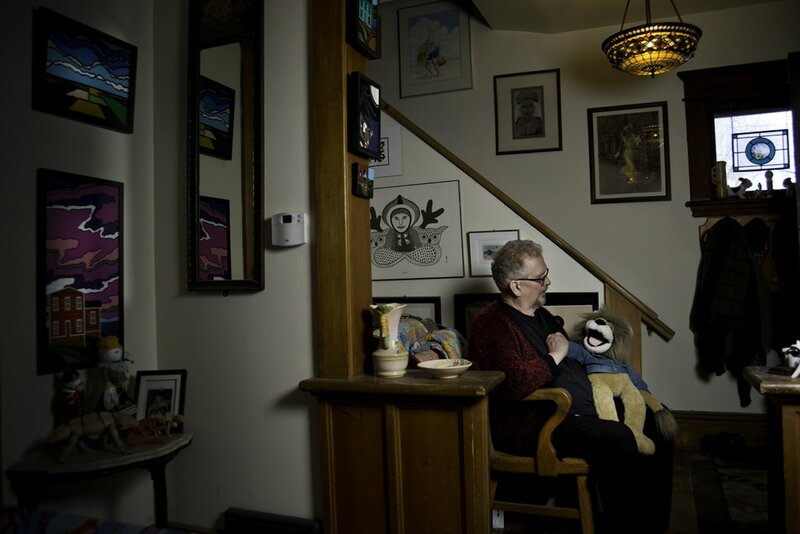 Bronson Smith, painter, collector of puppets and marionettes lives in a modest home in central Peterborough. When you enter the home, you are greeted on your left by his light-filled painting studio populated with a vast variety of puppets. The family of puppets range from characters such as Raggedy Anne to political figures from pre-war Germany and many more. On the work table are pieces in the process of being painted, prepared, routed and more. I had been here a couple of times in the past, either in photographer mode or during the Kawartha studio tour. So I was certainly familiar with what to expect. What I didn't know was that Bronson was a performer as well. He uses a small selection of puppets to entertain for those in situations where a bit of humour is a welcome relief. I'm sure he would describe that part of his life in detail if you asked. My memory escapes me at the moment. 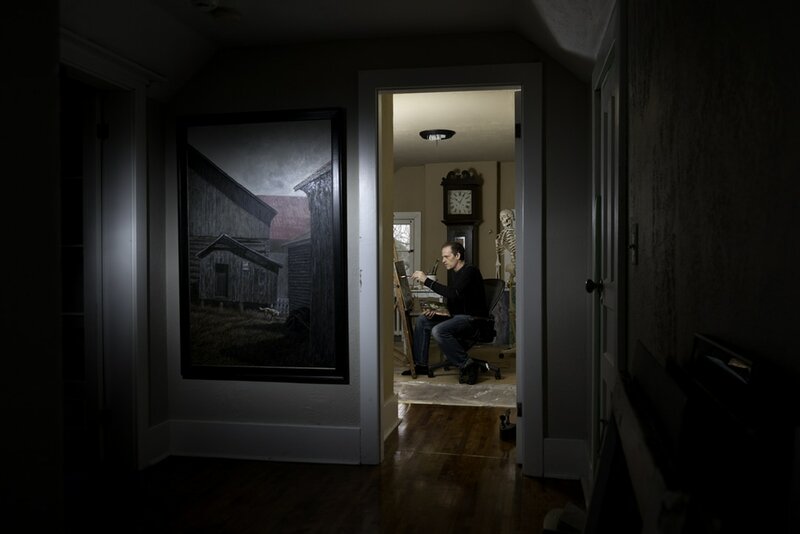 Before arriving at his home, I had a vague thought of shooting the image in his "comfy" painting studio. When I got there, I thought otherwise. I didn't want to repeat myself from years ago. I was hoping to do something new and fresh. The puppets, and our discussion is what led me to re-compose the image. He grabbed Leo and began to enter the world of entertainer. Right away I knew that Leo was an important part of what Bronson is about. He's more than a painter. He's a caring and compassionate person who uses this gift in a way to ease the burden of any number of people who are certainly in a difficult situation. Taking this as my cue, I arranged the composition to put them together near the stairway. One diffused flash to illuminate them, and one more to bring attention to a few of his routed paintings was all we needed. The two of them chatted away for a few minutes and I clicked and clicked. I'm a better person for knowing Bronson. And Leo. Paul Nabuurs, painter and live performer is a guy full of life. His energy is contagious. Finding his studio at the top of the 3rd floor walk-up on Water street, took me back to my days of apartment hunting in old neighbourhood Toronto. The floors creak, the lights flicker and the wallpaper has seen better days. As a reward for the climb is a cozy white walled studio that peers over one of the oldest streets in town, dotted with a small number of brilliantly coloured paintings in various states of completion. Mostly complete. The word was that his recent public show was a great success. Always good to hear. When I got to his studio and took a look around, the first thing that stood out was the interior architecture. Specifically the mysterious door frame that was echoed in the hall way. The fact is that having a door frame in that location, made no sense. Now, I had to solve this mystery. So I began to analyze the potential reasoning behind it. The conclusion (speculation) was that it was actually a door to a storage or maintenance closet of some sort. A second door had been cut between this tiny room and the original apartment. In the image of Paul painting, I am sitting on the floor with my back to this original (now boarded up) doorway. This was the gist of the conversation for the first 15 minutes of meeting with Paul. Mystery solved. Now onto the business at hand. 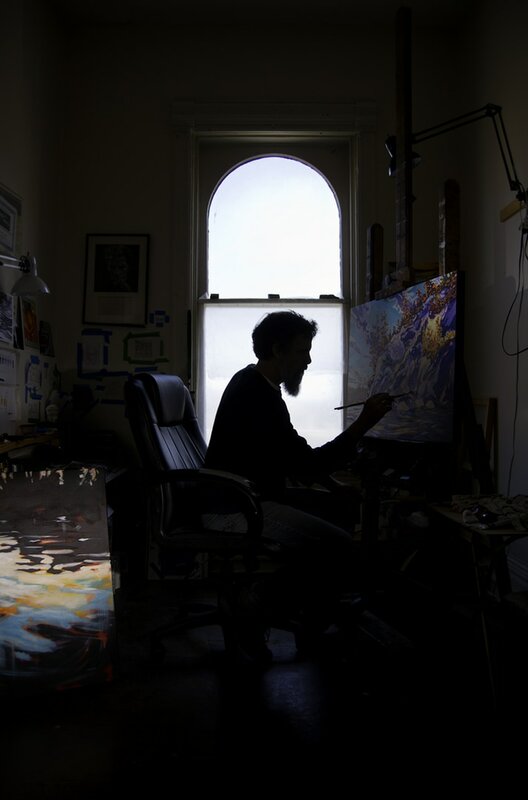 What is striking about Paul's painting space is the very graphic nature of the window overlooking Water street. A wonderful curve caps the tall window, typical of the buildings built in this time period. His easel sits to the right, the newest doorway to the left. To make an image with impact, I knew that a silhouette was the solution. I set up my lights to ad a touch of definition to the painting underway and the other near the door. The conversation continued. Photos were made. Thank goodness I always bring my sturdy tripod. I think that this studio would make a wonderful office for a particular photo-artist. Just saying. Next up, Christy Haldane, glass artist. Christy Haldane. 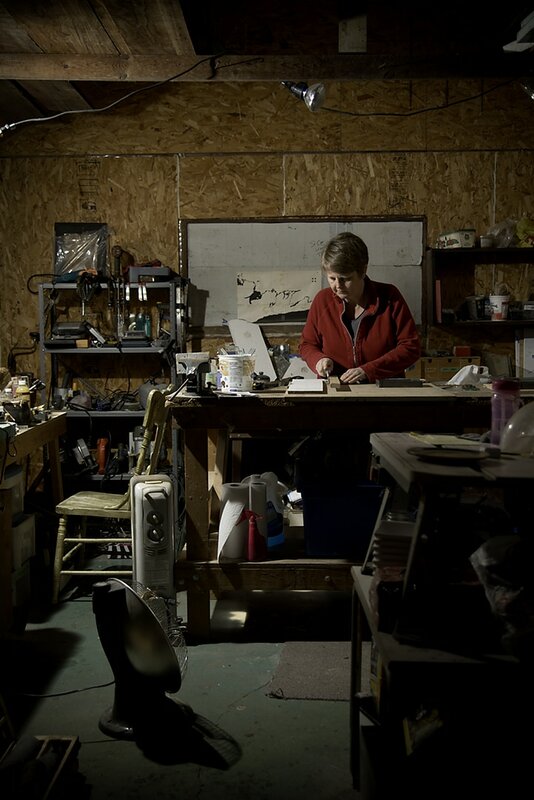 Working with sheets of glass might be a turn-off for the average artist, But not for Christy. She has built a career around working with a diverse and potentially fickle medium. I first learned of her work on a visit to the AGP with our little family. Her work at first confused me. I couldn't figure out how she was able to fuse the glass to the stone. In fact, I still didn't know until I toured her workshop and she revealed the secret. And no, I'm not going to share it here. You'll just have to ask her. Better yet, make an appointment to visit her yourself. I drove out to see Christy. Pulling onto the property, tucked back in the trees I was greeted by a few farm critters behind mild fences and her orange tabby (who's name escapes me). Chatting and getting to know each other for a few minutes lead me to learn even more about her past. I think we even went to the same college at some point, but probably not at the same time. Taking me into her primary workspace (I use the word space, carefully) I was presented with a production area that is obviously well valued for being able to hold even more equipment within than I would generally deem as safe. Let's just say, it's a wee bit cramped. On goes the radio, good tunes to cut razor sharp materials to. CBC I think. Time to consider where to put myself and how to light her. Oh, and that red sweater. I couldn't have styled it better. Pulling out the tripod, I sat myself down on the floor and started fiddling with my two lights. Moving a few little items out of the scene and I had my shot. That's pretty well how it goes for every image. 90% of my time at a studio is spent talking, locating the best angle and setting up a couple of lights. That's were there brain power comes in. That's were the creativity comes into play. Anybody can push a shutter release button. Not everybody can make an impactful portrait. I met Molly Moldovan about 10 years ago when I initially made the attempt at this project. At that time she was in a different house, in the same area with a larger studio space. I quickly snapped a few images of about a dozen artists at the time. Sadly, or maybe not so sadly, the project got pushed to the side while other life events took over. 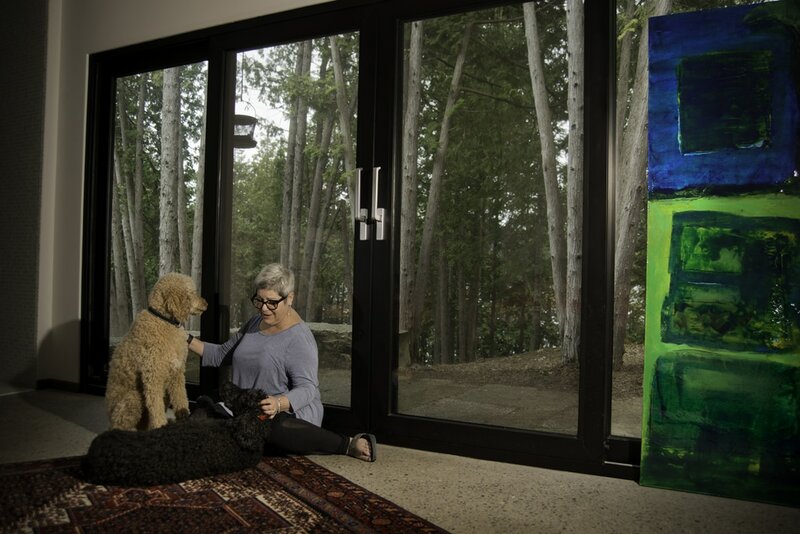 Since then she and her husband have built a new home, acquired a couple rescue dogs and her painting has matured even more than I remember. It continues to amaze nevertheless. As I approached the house the voices of two large poodles announced my arrival as the drizzle sprinkled from overhead. Hers is a home and studio with a myriad of interesting spaces for which I could have made a portrait. I considered no less than 3, and each would have said something different about the artist. We talked and talked and through that it was revealed that her dogs (the names escape me) were a major part of her life. So we should attempt to incorporate them into the image as well. So naturally, off to the bedroom. That's where I could work within a minimalist environment, get a piece of her art as well as her dogs into the same frame. Admittedly working the the shiny surfaced canvas was a challenge, as was dealing with the expanse of window. I think we pulled it off quiet well. Once again, I put myself into a corner and had to embarrass myself in order to manoeuvre around my tripod. I'm used to that, so no big deal. I should mention that I was delighted to see the work of another artist in Molly's home. If I'm recalling correctly, it was a piece by Lisa Mace, but don't quote me on that. Shaping molten glass, while sporting a bandana and grooving to some "trippy tunes". That is how I would synthesize the description of my experience with Brad. I'd been to a glass studio many years ago, but not with a camera in hand. I think it was at the Harbourfront Centre on Queen's Quay, Toronto. Before that I had visited the glass studio at Sheridan College in Oakville while a photography student there. Brad was pretty cool about having me in his workspace. Especially since his process is such a delicate one. I took a few minutes to simply observe. Watching his movements as he took a glob of melted glass from oven to forming table and back. I would have to say that this was a bit of challenge, mostly in finding the best angle. One that illustrated what the action was, giving a visual description of the environment while keeping out of the way. I have to admit that it would have been nice to have an assistant on this one. Returning to the light on camera left meant that I had to go out one door (behind camera) and into another to reach the light and make the micro adjustments necessary. If it wasn't for the billions of mosquitos attempting to feast on me every time I left the building, it would have been a more pleasant experience. But I'm not complaining. The fact that I got to watch a skilled glass artist make a usable object starting from scratch, was a suitable reward for making the drive, dealing with the bugs and all that jazz. Grateful I am. Gracious and friendly, is how I would describe my first impression of Anne as she greeted me at her home just off of Monaghan Road in Peterborough' north end. We made our way to her studio. I started asking questions about her work, how she works and all the regular stuff. I was glad to be working indoors, away from the bugs and potential rain. Eventually it did start to sprinkle outside as it had been doing on and off over the past weeks. What a weird summer. In practically every visit, I've asked that something be moved in order to provide a better composition. Anne happily obliged. We all got into the process, her husband included, and transferred tables, art work etc from one place to another and even out of the room completely. You know that feeling when you are making food in the kitchen and without a proper recipe, you just kind of "wing it". Try this and try that and hopefully you will stop when it's "just right". Well, that was the process on this visit. Eventually, I found just the right mix of light, angle, colour and texture. What really did it for me was when I asked where she liked to be when creating, and she said "sometimes I like to just be on the floor" or something to that effect. That was the key. Getting myself as low as she was, and to put it over the edge I needed the colour that her pink outfit provided. Thank you Anne.